Hello moms and dads! Welcome to world of cloth diapers! Have you ever heard about great benefits of cloth diapers, like high reusability, cost-saving, health safety, environmental friendliness, leak-proof effectiveness, etc.? Are you a newbie to cloth diapers? 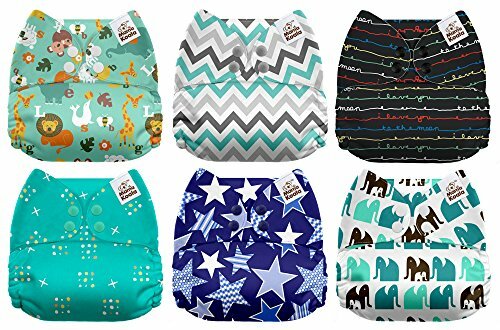 Do you feel overwhelmed with an abundant amount of information about cloth diapers and how to buy the best one from thousands of choices on the market recently? If so, here is what you should know! We’re going to tell you a lot, from classifying several types of cloth diapers to what you should take into account when shopping them. Let’s check out our best cloth diapers reviews! This means a lot. The biggest benefit is that you can contribute protecting our planet by reducing the number of disposable diapers which contain lots of toxins, especially Dioxin, Sodium Polyacrylate, and Tributyl-tin. Of course, your baby’ healthy will also be protected if she uses cloth diapers. A cloth diaper costs you more than a disposable diaper. However, since cloth is a reusable material, it’ll be more cost-effective for long-term use. If you plan on having more than one baby, you’ll save a lot if starting using cloth diapers from now on. Cloth diapers are truly effective in use. Their high-quality materials provide maximal comfort and moisture prevention. You can also add inserts to make sure your baby will be dry all day and night. Many of them are also as easy to use as disposable diapers. Also known polyester in the diaper industry, microfiber is an artificial material which is widely used in making inserts due to the inexpensive price and machine washable safety. Besides, it’s quite absorbent which can contain 7x its weight in liquid. Another advantage of microfiber is very quick drying. The bad thing about this material is that it’s difficult to get thorough cleans, and thus tends to develop stains over time. Additionally, as microfiber inserts contact directly with the sensitive baby’s skin, they might cause irritation. That’s why they’re often in pocket diapers where the lining act as an insulator between them and the baby’s skin. The best thing about bamboo fabric is that it’s extraordinarily absorbent and performs excellently in wicking moisture away. It’s anti-bacterial, anti-microbial, anti-fungus and anti-odor as well. For these great properties, bamboo is mostly used in making inserts. People thing that bamboo fabric is natural, but this is a misunderstanding. In fact, the process of making bamboo fleece involves harsh chemicals which might cause negative effects on the baby’s skin. PUL is produced by laminating polyester to a polyurethane layer which is a kind of plastic. It’s very thin (about 1-2mm), and thus, highly breathable and stretchy for a close fit. On top of that, the excellent waterproof makes it become an ideal material for diaper covers. Abrasion resistant and anti-microbial property is also a great characteristic of PUL. Since the process of making PUL relates to solvents. As it degrades over time, it might have negative effects on the baby’s skin. Slightly high price is another drawback. TPU is a particular kind of polyurethane and created during the process of heating-bonding. TPU and PUL share plenty of similar properties. Both are lightweight, breathable, waterproof and great for making covers. Hemp is one of the most eco-friendly fibers for diaper’s inserts so far since it’s 100% natural. It can resist bacteria and fungus growth. Although hemp is superb thirty that can hold much more water compared to microfiber, it cannot absorb moisture as quickly as microfiber. That’s why hemp is usually blended with another fiber, commonly cotton, to boost the absorbent speed. About drawback, this material is not the best for baby’s skin since it’s a little rougher compared to other fabrics. How absorbent your cloth diaper mostly depends on its material. As I mentioned right above, different materials offer different levels of absorbency. Some are prominent, such as hemp or bamboo, while the others are just good, like polyester or TPU. As a diaper fits well the baby’s bottom, legs and waist, it reduces the chance of leakages. But there usually exits small gaps around the baby’s legs in spite of choosing the proper size of diapers, which leads to pee can escape to the outside. Elastic around the legs and waist prevents this sagging since it’s designed to cling and refill the gaps. There are two common types of closures that you easily find in most diapers. • Hoop-and-loop closures: They work in the similar way of Velcro. They’re easy to adjust for the most extract fit. But because of that, toddlers can pull them out. • Snap closures: They’re a more popular choice. As closed, they’re very secure and keep the position over time. The disadvantage is that they’re less flexible in size and more difficult for parents to unfasten. Before we go deeply into analyzing and choosing best cloth diapers, you need to know which system is suitable for you and your baby. In general, there are five major types of cloth diapers. Each one has its own advantages and disadvantages. They’re the cheapest choice. That’s mostly because the cover allows several days of use without having to wash or replace. Versatility is another great characteristic. Not only they’re used as diapers, but you can also use them as changing pads or burp cloths. Besides, by folding in different ways, you can change the absorption level. The best thing about fitted diapers is that they’re pre-made in shape, and thus, don’t require any folding before using. Another major benefit is that they absorb liquid and moisture very well thanks to the multiple-layer inner lining. Fitted diapers cost more than flats and prefolds. They’re relatively bulky and heavy compared to other types of diapers. Having a pocket means you can completely adjust the level of absorbency of your diaper. You can also switch between different types and materials of inserts. For example, using a microfiber insert during the day and a hemp one for nighttime. Pocket diapers are simple to use since there is no folding to deal with and no covers to add. The biggest “nightmare” of using pocket diapers is, obviously, the process of pulling the inserts out. Sometimes, you have to put your hand into the pocket opening, and yes, this is very dirty and annoying. Every time you wash the insert, you have to wash the cover too. This is a minus point compared to flats and prefolds. This shows you how to use a pocket diaper. This is the Rumparooz One Size Cloth Diaper that I’ll review later. Just like the name suggests, this kind of diaper includes everything in one single design: A waterproof cover, an absorbent inner layer, a wicking layer, a fastening system, and even elastic around the legs and waist. Using AIOs is as easy as using disposables except they’re reusable diapers. Everything is pre-made for maximal convenience. No folding, no cover added, and no confusion! They’re the greatest choice in terms of containing your baby’s poop and pee. That’s because they have many layers as well as leg elastic. Money is the key drawback. Among cloth diapers, AIOs seem to be the most expensive. Since they include so many things, they also take longer time to dry. All the parts are already sewn together. So, it’s possibly impossible to adjust the level of absorbency. A hybrid diaper is a system of an absorbent insert and a waterproof cover, which is quite similar to a pocket diaper. The inserts used in hybrids can be either cloth or disposable.​ That's why it is called "hybrid". They allow you two choices of inserts. Depending on your situation, you can choose the right one. For example, at home you might use cloth inserts, but disposable ones could be more convenient for traveling. The design is often lack fits, which results in the chance for leakages. Using them could be a little bit complex for beginners, but with little practices, this concern will disappear. Disposable inserts contain SAP which takes hundreds of years to discompose. If you care about our planet, you should use reusable inserts instead. 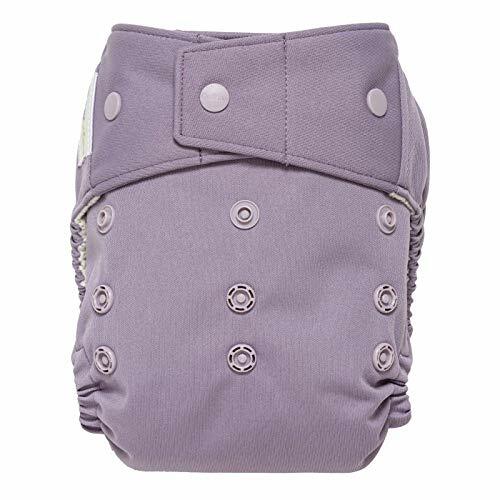 Also called Rumparooz G2, this pocket diaper can fit every baby with the weight ranging from 6 to 35 pounds. That’s because its size is customizable, allowing up to 4 different sizes for either newborns or toddlers. The diaper impresses me by its leak prevention technology with double inner gussets adding an extra row of elastic at the diaper’s leg. While these gussets keep the urine locked in, the waterproof polyester outer layer keeps the outside dry all day and night. Here is the greatest deal as purchasing. Two microfiber inserts are included as purchasing, and they’re different in size and shape. As you combine them (using snaps) in different ways, you can customize the absorbency level with up to 6 different choices. Nearly 200 customers on Amazon give positive feedbacks for this diaper. They love it because it’s not only easy to use but also simple to clean. The inserts rarely move around, and they’re clearly washed by first rinsing in cold water without detergent, then cold rinsing again (or hot washing) with a recommended amount of detergent. Semi-attached, Stay-Dry inserts dry faster and allow for customized absorbency where your child needs it most. Patent pending 3 x 3 adjustable snap system to fit most babies from birth to potty training . Fits most babies 7-35+ pounds. I like the semi-attached inserts of this diaper because I can overlap or fold them in several different ways to adjust the absorbency. 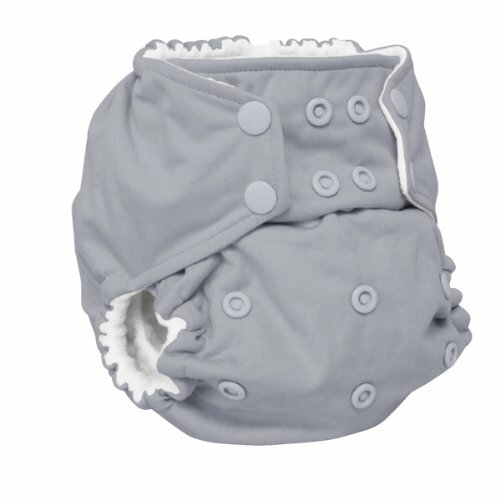 This structure also reduces the drying time which is a great advantage of BumGenius Freetime over other AIO diapers which often take long time to dry. Both inner and outer layers are made of 100% polyester allowing good absorbency. The diaper also comes with a 3x3 adjustable snap system allowing you to customize its size and shape to fit any baby weighing 7 to 35 pounds. Besides, the snap closures on the front side are strong, which not easy to lose or break. Customers on Amazon love the ease and convenience of use of this diaper with no stuffing involved just like disposable diapers. They appreciate the dual-layer that don’t easily come apart like many AIO diapers. Patented leak-proof outer cover and stretch-to-fit sides for a custom shape and fit. Patented covered lining opening protects baby from moisture. Soft lining wicks moisture away from baby. Patented 3x3 snap system adjusts to fit babies 7-35+ pounds and gentle leg elastic prevents leakage. 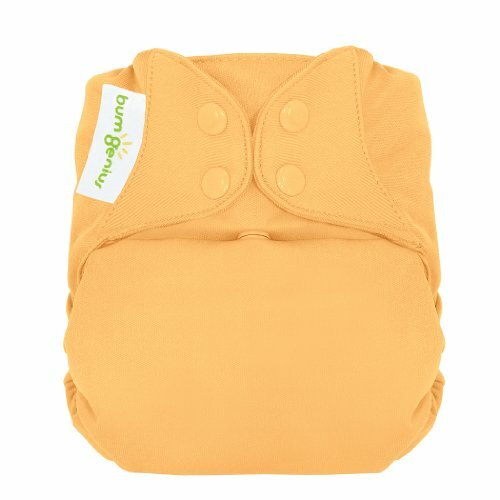 Another great product from BumGenius with the same quality and convenience in using, making it deserve to be on the list of best cloth diapers. Although this one comes with two inserts (one for newborns and the other for toddlers), it’s a little bit cheaper in price. While the patented cover with gentle leg elastic is great for preventing leakages and odors, the soft lining wicks moisture away and keeps your baby comfortable. Like the previous diaper, it’s also very stretchy and has a durable 3x3 snap system allowing easy and quick adjustment to fit your baby as she grows up to 35 pounds. Customers love these diapers since they’re very absorbent and rarely leaked. The two inserts included are lightweight and different in size. When the small insert become too little to your baby, you can use it in conjunction with the larger one to add extra absorbency for heavy wetters or overnight using. Read more our top picks of best overnight diapers ! 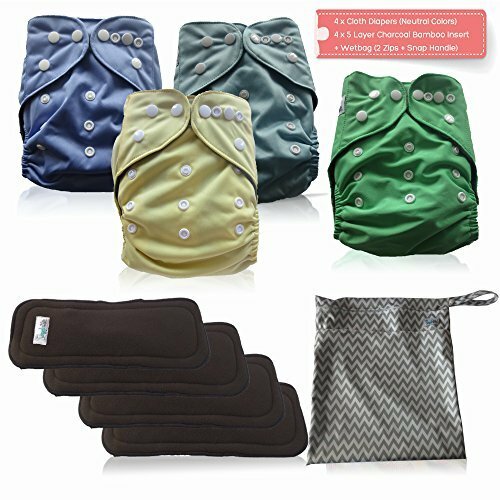 TOP QUALITY CLOTH DIAPERING SYSTEM: What do you get when you combine the most modern textiles in cloth diapering with the old-school concept of a waterproof diaper cover that's reusable between washes? The GroVia Hybrid Snap Shell Diaper! 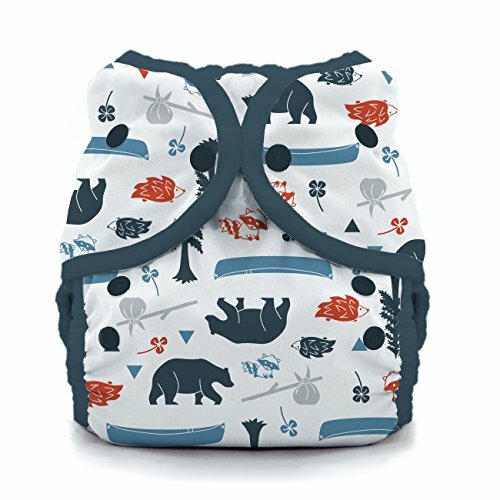 ADJUSTABLE FITTED COVER: The reusable Snap Cloth Diaper Shell is adjustable to fit babies from 8 to 30 lbs. This diaper closure is easy to master, very similar to the traditional disposable diaper, and truly loved by parents! 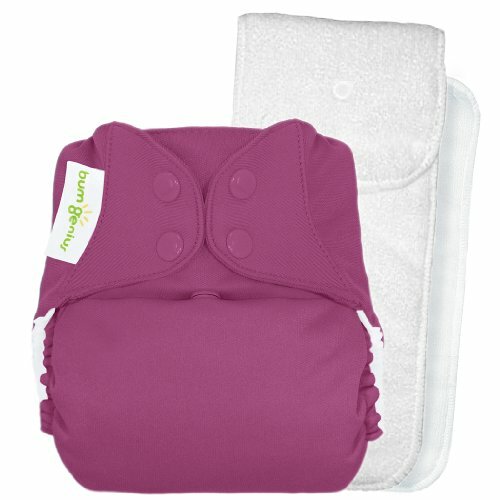 EASILY ADD ABSORBENCY: There are so many options of absorbency when using the hybrid cloth diapering system. Pair the stylish GroVia Snap Shell with any combination of snap-in Soaker Pads, economical Prefold cloth diapers, or eco-friendly disposable BioSoakers to create a simple, yet flexible, modern green diapering system that anybody can change and everybody will love! MACHINE WASHABLE: Remove as much solid matter as possible from the Shell. Place soiled Shells in a dry diaper pail - no soaking necessary. Wash every 2 days on warm with detergent. Hang dry Shells (high heat causes excess wear). Do NOT use bleach, enzyme cleaners, or fabric softeners. SAFELY MADE: Healthier for baby, less diaper rash while making less waste in our landfills, save hundreds of dollars each year, and no dioxins! Fairly and conscientiously made in China. Since it’s a hybrid diaper, you can use GroVia Hybrid Diaper with either cloth inserts for environmental benefits or disposable inserts for convenience of use. Another way is to go with GroVia soaker pads which are made of biodegradable material, and thus, very eco-friendly. Another great thing making this diaper even more versatile is that it features both snaps and hook-and-loop. Especially, the hook-and-loop sticks very well yet soft enough so that it cannot scrape your baby’s skin during changing. The liner is fluted at the sides and sits like C shape, which not only offers wider coverage but also helps you stuff the liner easier. Tabs on the hook-and-loop make it very simple to get the right angle for a perfect fit. This makes sure that no leakages can occur outside the shells. Parents love this diaper because of the versatility and great leak prevention. It’s also easy to wash without having to be dried in a dryer. Just 1-2 hours of air drying and it’s ready to go for the next use. There is only one thing to complain is the big and bulky design in both width and height. It’s just a shell only. No inserts or soaker pads included. ​The diaper wrap is made of polyester with TPU laminate, which makes it highly breathable and waterproof. While the soft fabric liner prevents your baby from chaffing or red marks, the innovative leak-proof protection together with leg gussets keep all the liquid from leaking out. Even heavy wetters can feel comfortable with this diaper. One note for you is that this diaper has 2 sizes, size one for newborns (6-8lbs) and size two for toddlers (18-40lbs). The disadvantage here is that the smaller size will become useless as your baby grows up, so investing in the larger one is a must. More than 1,100 customers on Amazon like this diaper because of low price yet excellent quality. They said they never found leaks during day and night. However, Thirsties Duo Wrap Snap is a wrap (or shell) as its name suggests, so you shouldn’t forget to buy inserts separately. Personally, I prefer fitted inserts rather than prefolds or flats because the first choice is much easier to use. It’s just a wrap only. No inserts included. (This is my favorite and I highly recommend this package). 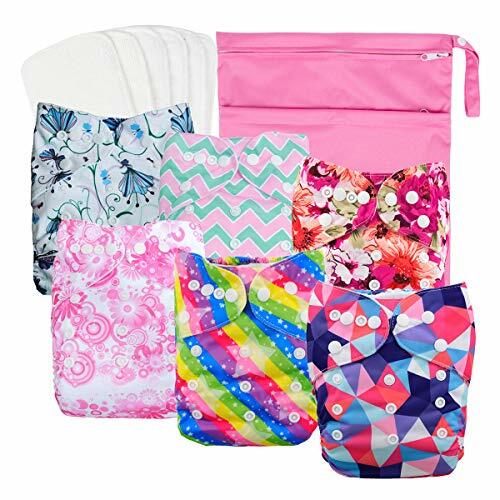 ​This Nora's Nursery set includes up to 7 pocket diapers, 7 inserts and a snap-handle bag. These inserts contain 4 layers. While the two outer layers are made of bamboo to help your baby feel comfortable, the two inner layers are made of microfiber to wick moisture away and retain dryness. Besides, the snug leg elastic is a great addition to eliminating leaks. Each diaper is equipped with an adjustable snap system that grows with your baby until she reaches 33 pounds. I also like how quick the inserts dry. Simply put them into a dryer with a low-heat setting as recommended by the Nora’s Nursery, and about ten minutes later, they’re ready to use. In addition to the great quality and affordable price, many customers love these diapers due to the excellent customer service. For example, a mom bought it via Amazon, and she found that the front zipper on the wet bag was damaged. She emailed the company, and they sent her a new one two days later. However, the biggest drawback of these diapers is their minimal size setting (up to 10lbs), which make them cannot fit well a 6-lbs newborn. Although there are 6 diapers in this Alva package, the number of inserts is up to 12. This means that you don’t need to buy extra inserts to double the absorbency anymore. The biggest surprise here is the very affordable price which is the same as the previous package from AngelicWare (4 diapers and 4 inserts). The inserts are made of 100% microfiber terry cloth. Despite being relatively thin compared to most inserts out there, they take less time to dry, particularly, only a half of hour. For overnight use, it’s recommended to use two inserts at the same time to make sure no leaks can occur. The cover and inserts need to be washed separately in cold water (under 86 Fahrenheit as suggested by the manufacturer) with either a little salt or a few drops of detergent. Just make sure you don’t wash them together with other clothes. A few parents express their disappointment as the inserts become defective and fall apart after several months of use. Also, they don’t contain much pee and smelly as well. One Size fit 0-2 Year Babies: Diapers with adjustable snaps fits babies or toddlers from 7 to 33 pounds and grows with your little one. You can adjust the diaper to your desired size (S, M or L) by snapping onto different rows of buttons on the diaper. Save Money & Environmental-Friendly: Cloth diapers with inserts are less expensive than disposable diapers and reduces less waste. Our cloth diapers are completely free of dioxins, sodium polyacrylate and other chemicals, or contain any BPA, Phthalate, Latex or Lead as well. Strong Absorbency with Breathability: These diapers are reusable and fully machine washable, and will become more absorbent when they are washed. The microfiber inserts are of high softness and comfort, keeping your baby's skin dry and avoiding less rashes. Water-proof & Leak-Free: The outer layer is made of polyester with waterproof and breathable TPU. Leg gussets are against most of the leaks and comfortable elastic around the waist and legs to prevent leaking. Packing List: 6pcs diapers + 6pcs microfiber inserts+one wet bag. This Babygoal package includes 6 diapers, 6 inserts and a wet bag. It’s not the best but great at the price point. Each diaper is equipped with a waterproof outer made of PUL and a soft lining with suede cloth. The inserts are made of microfiber and contain 3 layers. Also, the leg gussets are great additions to preventing leakages. Using these diapers is simple since there is no pilling to struggle around. The bottom has three rows of snaps which are highly adjustable. Whether your baby is 8 or 35 pounds, they make sure the diaper fits comfortably and gently. Customers satisfy with this product. The biggest complaint is that the opening for inserts is too small, so they have to get one hand on it to pull the insert out. Also, the tight elastic (not flaps) around the opening makes it even harder to deal with the inserts. Like most best cloth diapers sold by package, Mama Koala set also comes with 6 cloth diapers and 6 inserts. Each diaper features a breathable and waterproof TPU cover and is designed for both newborns and toddlers (from 8 to 35 pounds). But what I really appreciate is its inner lining which features a very soft layer of fleece. Each insert contains three layers of microfiber inserts which are highly absorbent. But I’d suggest you stuffing the pocket with two inserts for both daytime and bedtime because using only one might cause some leaks as many customers complain. The 3x3 rise snap system allows you to adjust the diaper size easily and provides a trim fit. Unlike the previous product, this one has a slightly larger insert opening. So, you don’t need to put your hand inside the pocket to take the inserts out. However, a few customers disappointed with the elastic’s quality. They said the elastics was a little bit lopsided and got worse before stop working after a month. Fortunately, many compliment the customer service of Mama Koala. A mom received a damaged diaper, she requested the manufacturer for replacement and they sent her a new one quickly with no charge. As purchasing the pack, you’ll receive 4 pocket diapers, 4 inserts and a wet bag. 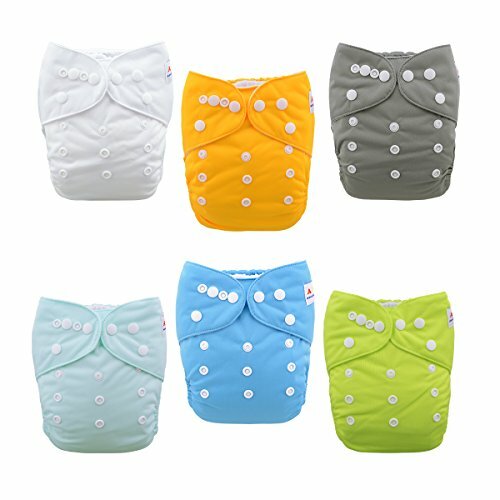 While the diapers are equipped with double gussets that keep the liquid from leaking out in a much better way by adding an extra row of leg’s elastic, the inserts contain three inner layers made of microfiber and two outer layers made of bamboo which is the softness and most absorbent material available. The one-size diaper has many snap closures providing flexible adjustment to fit both infants and toddlers weighing from 8 up to 35 pounds. You buy it once, and you can get its benefits year by year. In addition, cleanup this diaper is also very simple since it allows machine washing. Customers appreciate the AngelicWare diaper for many reasons. In addition to the ones above, they say they love its dark lining which makes the stains invisible. Also, the 30-day money back guarantee is a great deal that very few diaper brands offer. However, some customers complain that the leg gussets are loose on some size settings, which leads to some leakages. To conclude, I’d suggest the Rumparooz G2 as the best cloth diapers. Their leak prevention technology with double inner gussets works really well. Four sizes in one product, so no need to replace as the baby grows up. Microfiber soakers included make them even more valuable to buy. Ease of use and clean is another great deal. 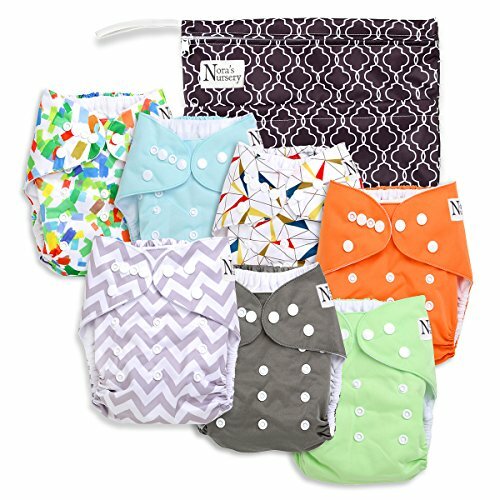 If you want to save your budget by investing in pocket cloth diapers sold by package, then I’d recommend the Nora’s Nursery. The bamboo-polyester inserts are prominently absorbent, anti-bacteria and anti-odor. When they combine with a waterproof cover, TPU lining and soft suede cloth, they guarantee that your baby will be dry and comfortable all day and night.